Palestinian Eggplant Maqloobeh meaning eggplant upside down, is a one pot concoction in Palestinian cuisine, where rice, fried eggplants, sliced tomatoes and boiled meat are cooked together until the rice is cooked through. Once done cooking, the pot is then turned upside down over a large plate, to reveal a rice concoction that looks like a cake. This is mainly it in general but of course there are many variations where other vegetables are also included. This dish is also very popular in the whole of the Levant and nowadays is a very well known dish all over the region. The other day, I was surfing through instagram and found Hind’s post on Palestinian Maqloobeh. Hind is a friend of mine who is also a Palestinian Chef based in Paris. In her instagram post, she was saying that French Chef Cyril Lignac was making eggplant Maqloobeh on TV in one of his cooking episodes and that he explained maqloobeh as originally being a “Yemeni Israeli dish”!! Furthermore, she continued that he said: “some Palestinians do make maqloobeh, but it’s not originally Palestinian.”!! Having seen that, I of course wanted to comment, because I found there were too many claims there that were not necessarily true! 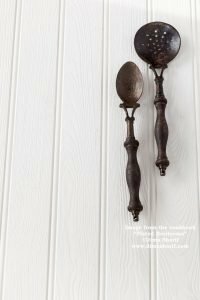 Afterall, I am one of the people who are fascinated with food history and do spend most of my food reading time, reading and exploring the history and origins of foods, historical cooking techniques, and historical cuisines. I have in fact participated in many discussions, studies, debates and projects (both locally and internationally) that dealt with food history, and origins of concoctions and ingredients…etc. So of course, I have huge respect for food history and really don’t like it when people are misinformed with such baseless claims. And so, I wanted to leave a comment that actually presented a very logical argument. We all know that instagram comments are not the easiest typing tool or platform but I still took the time to type the below argument, only to find that instagram deleted it as soon as it was published!!! I then received a message from instagram to tell me that they deleted my comment because they “need to protect the community”!!! I was so confused, what about what I said (the full comment is below for you to read) was threatening the community?! I found an argument that I knew was a baseless historical claim, typed a logical point of debate explaining that the claim cannot be based in truth. Worst case scenario, it should open a discussion!! Anyhow, I will not delve into those details as I am sure you all get the issue in all its angles, however, I felt it was important that this discussion is actually brought forward, at least explaining why I think, with all due respect to the very talented Chef Cyril Lignac, that his argument stating that “Eggplant Maqloobeh is a Yemeni Israeli concoction and not originally Palestinian” is in fact baseless where history of food is concerned. Here is my “unsafe” deleted comment by instagram in which I made my point, for you to read and perhaps even discuss. That was my very unsafe comment that had to be deleted to protect the community! Anyhow, I do not wish to dwell on any of the above meaningless claims, rather why not have an educated discussion instead? Why not actually talk some proper food history, not wishes and claims but actual historical facts? Isn’t it better that we explore some tools that can be used as keys to determine actual food history? Cookware: when looking into food history cookware is a huge teller of era, area and social class. These elements are all very important keys to determining who cooked what. A small example in thiscase will be ‘fried eggplants’. Since the eggplants are fried in Maqloobeh, that necessarily means a metal pot was used, because historic clay pots could not have possibly withstood the heat of the oil required to fry the eggplants. That fact, straight away, rules out any ancient prehistoric era from being the era in which this cooking method was used. In fact, going back to documented historical narrations, documentations and historical books as well as books that deal with food history, you will find hard evidence that ‘frying’ as a cooking technique was introduced in the Medieval Islamic Era, and was limited to the Kitchens of the Medieval Islamic Courts of the rulers, mostly in today’s Iraq and the Levant. In history books this is explained as being due to the fact that metal cookware was very expensive to produce at the time, and as such was a luxury available only at the rich courts instead of being a common product used in everyone’s kitchens. In fact, it was even limited to the main royal courts rather than being available to each and every division or representation. Yes, it did with time travel to other courts, eventually making it to each one of our kitchens today, but this luxury we have now, was not so commonly available. This specifies the earliest point this dish could have appeared, and the most likely group with access to this food had it appeared in that specific time. Yet, this point does not yet solve the issue, more investigation has to be carried out. Ingredients: the ingredients that are staple in a concoction, the ones that make it what it is are also a key to telling area, era and eventually consumers. In this case if eggplants are not a staple ingredient in Yemeni cuisine, where there is no evidence whatsoever that in Yemen people ate eggplants in their early history, or in their historic cuisine. When there is not a single historic recipe containing eggplants in its ingredients, then how could it possibly be that an eggplant Maqloobeh (obviously reliant on eggplants) will have originated from historic Yemen?! We do know for a fact that Maqloobeh is not a relatively new dish, by that I mean it is not a dish that came to existence in the past 100 years! It is historically documented in books that are way, way older than that! And it does exist in the memory of generations that have existed much earlier than 150 years ago, whose grandchildren (today’s grandparents) remember eating it at their grandparents’ homes, and who have eventually passed it on to us. Credibility: The source of historical information cannot be the day dreams of people, the wishes of anyone or the “it would have been nice if I had thought about it first” kind of sources. History is not a wish, mood or forced narrative. History took place, it happened and no matter what we do, it always leaves traces behind that lead to the unfolding and disclosure of its whole true and factual story. Sometimes we are mislead half way through by lack of evidence, lack of technology, by baseless claims, by incredible sources, by twisting of facts or by plain old lies…etc but history always leaves crumbs and traces, and the informed, serious, knowledgeable scholars always eventually find them, follow them and unfold the truth through them. Therefore when we want to explore history, determine origins, find facts and learn from the past we have to go to credible sources. We have to carry out a study, we have to examine the facts, we need hard evidence, we must read many many books, and have many many documented sources, studies, historians… that have reached the same findings. It really cannot be based on an entertaining TV programme, obviously misinformed, or a magazine article about food history written by a belly dancing expert, or even an instagram post deleted most probably by a teenager hired to determine what information people should/shouldn’t have access to… Least of all should the information ever be based on evidently and provedly lying sources who are continuously and actively telling lies, twisting facts, and straight out lie to your face even when all evidence and action shows the opposite of what they say/claim. You see, I am not even asking you to find what I say credible or my point of view to be the right/wrong one. I will not make such uninformed claims at all. I only discuss a historical fact when I arrive at one, and back it up with sources (my award winning book Plated Heirlooms is a live example of that, check it out and see for yourself). I hope this post encourages us to get more informed, and to drop out of idiot lane because it’s become so old and boring! Why not be informed, and actually not the dump for informational rubbish? And yes it does matter, because nowadays all kinds of injustice get carried out in the name of such baseless historical claims and actively deleted truths! So yes I do think it is a big deal and do think we must be very well informed before we speak! that I tried to find that episode online, to see it myself, but could not find it online, it was aired on TV. I did however find a trailer about Chef Lignac’s visit to Palestine, where he toured and spoke to many chefs over there exploring the country’s food and restaurants. In the trailer, one of the resident chefs he was visiting, was preparing a mixed vegetables maqloobeh and explaining that it is a “Jewish Iraqi” dish that required cooking overnight, but that he was preparing the quicker Palestinian version of the dish. I am therefore not sure what the claimed origin is, the comment above was to the instagram post that said Yemeni, however, even if it is Jewish Iraqi, then it falls under point number 3 “Time” above. 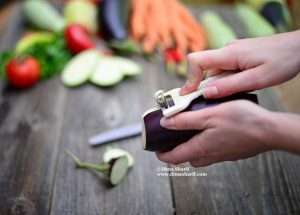 With that said, I still have decided to share this post with you here because regardless of the details, it still is useful to share with you a few tips on how to approach food history and check the truthfulness of the information you come across. 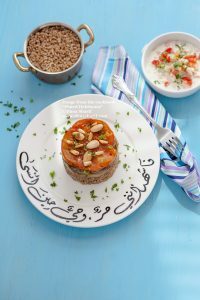 The best ever Eggplant Maqloobeh Recipe is in my book Plated Heirlooms. 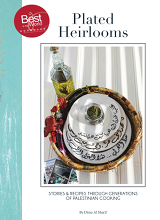 Order a copy and get your hands on a complete resource of Traditional, authentic Palestinian cuisine recipes. I did in fact write a whole book (500 pages) about Palestinian cuisine, its story and some of its history, including all its traditional and age old recipes.. if you wish to know more about this cuisine and see how I tackled some of these issues, then order your copy here, we ship worldwide.